I also think of my mother's baking. I finally got her to give me her recipes below. They are always a hit with my guests. She does not have a clue where she got them! Eileen's Family's Favorite Passover recipes pages. I have had many requests for Jewish Patterns. So my boys and I have made some Jewish Symbols to get you started thinking and designing your own. Let me know if you design any and I will add them to my site. Facts, Fun, Lessons, and Crafts. ENJOY THE HUNDREDS OF PASSOVER LINKS AND LESSONS ON THESE PAGES! Generic catalogs and ordering information plus other resource links. Hundreds of Links to sites for reading Jewish stories, comic books, GAMES (for little and big kids), music, make email cards, Holiday fun, learn Hebrew and Yiddish words and MORE! Having a special glass to use to welcome the Magical Elijah to your house can be another addition to your familiy Judaica. Again many people have family/inherited wine cups they use for Elijah. But making one is also great. Also one site on this page also suggests a special cup to honor Miriam. This sounds interesting and I will look into it for my next seder. 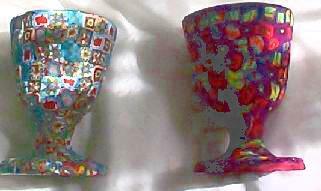 See my Clay page or my clay on glass pages To give you ideas on making kiddish cups using a glass goblet covered with Polymer Clay and to see additional pictures of cups. If you use polymer clay like Sculpey and seal with a Sculpey Gloss, should be able to use the kiddish cup. I prefer to use a glass goblet rather than just shaping a kiddish cup out of clay. The glass gives it a great feel and seems safer as a liner for drinking. I suggest you do not go over the lip of the goblet. Stop at the edge. Since grape can stain things it might be worth using White grape juice or wine for these cups. 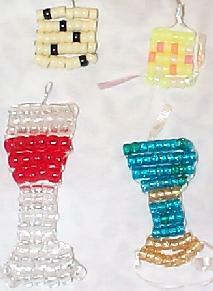 This is a fun craft and easily adapted to a Jewish Theme. Shrinky Dinks are Shrink Plastic Sheets. What ever you can draw or trace with color pencils or permanet markers can be made into a key chain, magnet, jewelry etc. You bake the plastic on cookie sheets in your home oven or toaster oven. They shrink about 1/8th the size and thicken. I have done this craft with even 3 year olds using colored pencils. (on roughed up sheets - see their prebuffed ones.) We at camp used 1/4 sheets, punched with paper punch and made great key chains. No limit to the imagination on this craft. For Pesach try drawing Seder plates or pieces of Matzo. Makes great Pesach jewelry. There are some great Jewish Rubber stamps that can be used in many different ways for Pesach. They can be used on the Shrinky Dinks above or on paper. The teacher or parent can stamp the designs for the kids to keep them cleaner. (kids and papers.) I have xeroxed my stampings and then had the kids color them in. The new gel pens are great. These stamps can be used as labels for place cards. You can also stamp directly onto a paper to decorate your Pesach Place mats. These look great for each place setting. You can cover with clear Contact paper or if you are lucky to have access to a laminating machine. Laminate. Most families have a special Matzot cover. But how about pillows? One of the commandments for the Seder is to lean or recline during the seder. Many people have special pillow for at least the Seder Leader. How about pillows for all of your guests? Of course we all have nothing better to do before Pesach! But if you make the pillow cases cute but generic, (don't put peoples names.) You can make one or more each year until you have a set. Rubber stamps with fabric paints are just one idea for painting the pillow case. The rubber stamp companies have many Hebrew letters and designs. Hand prints are another way to make original pillow cases. Of course dating the pillow cases too. More and more I am seeing Day schools and commercial sites selling some kind of bag with toys in it for the preschool (and others) to have during the Seder. I have heard that some have toys that represent each of the plagues. You have to be creative with plagues like Boils! Toy frogs are a favorite of these bags. I have not seen the bags in person but some of you other creative people may be able to email me with what you used for your bags. I just wanted to through the idea out there. Can't imagine what they would do with the killing of the first born! Scarry just to think how you would even discuss this one with child. Use little see through plastic containers or bottle filled with water, oil and add red food coloring or red water color from Discount Supplies. Every year, I go out and look for cool toy frogs. One year, I found some where the eyes' bugged out when you squeezed them, the kids loved it! I have used the plastic frogs you make jump, and sometimes just plain small frogs. I have used balls of foil, plastic balls (like ping pong balls), and small styrofoam balls. Since the hail was actually "fiery hail" I found these clear bouncy balls a couple of years ago, when they bounce, they light up reddish/orange. These are my favorite. we have a picture of a baby with a circle and slash drawn over it. Some people I know use small plastic toy knives. Shelly made these plague bags for her shul's community seder. I have made a few of these the last few years. I have melted lots of chocolate in other molds and new it would be very easy. Especially with microwave melting. This proved the same. I bought 4 molds (see link below) with the idea of using some later for plaster. But after two years now I realize I need all for food. Everyone loved them as gifts. Plus you may need some for dairy and some for parave! I have found Shifra bittersweet chocolate for Passover. Parave! I do not usually like bittersweet but I also can't eat anything dairy, but this chocolate was incredible and smooth. It took 2 15 oz bars to make 3 plates. One suggestion is to make sure to fill the mold right to the top so the indents do not show at all. Otherwise it will be thin at these spots. I ended up adding chocolate after I filled the mold the first time. It just meant smoothing it with a dull knife to make the layer added look smooth. It was a big hit for my hosts at the seders as was the brownies (see Mom's recipe below.) and the chocolate covered matzah. (Also see link below) We could not resist. 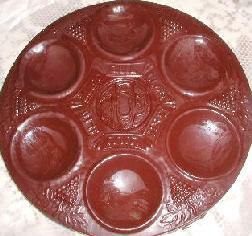 Jewish candy molds. Some hard to find Jewish molds for making candy. 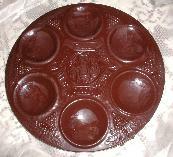 Including this large mold for making a chocolate seder plate. It is pretty close to a full size seder plate! They sell supplies for soap and candies. They have been wonderful in trying to find kosher products. They said many of their supplies were O-U kosher. The are carrying the Shifra chocolate but you will have to ask if any of it is the Kosher for Passover on the label. I have bought other brands of Passover chocolate and they were fine too. Candlylad made an incredible effort to get all of their Kosher products and Jewish molds listed on their website. It was a pleasure to work with them. I also bought their catalog which is huge. DON'T WANT THE CHOCOLATE? MAKE IT IN PLASTER? I will have to ask some Rabbis but most chocolate molds can be used for plaster of paris molding. Just buy a second one as you don't want to use one for food and chemicals like plaster of paris. This may be a great project for a fun seder plate. 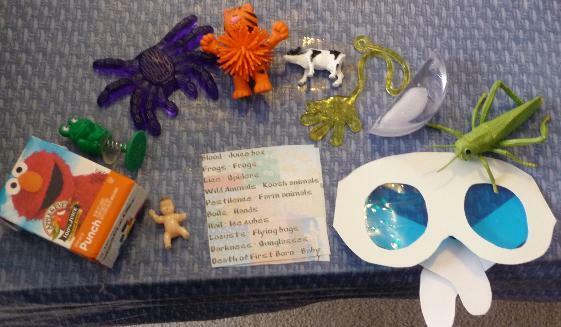 One the kids can make and "play" seder but not one you might want to use for food. If you use a shellac or spray lacquer you could probably use it for the plate and use clear glass dishes for the food to sit in. Or put a wire hanger on the back when the plaster is wet. Make sure to balance on the edge of the mold or it will sink totally into the plaster. Then you when you are finished painting etc you can hang it on the wall as a new piece of Judaica! If you use the Faster Plaster Brown antiquing finish you can make it look like wood. Just paint over the whole thing either plain or after the paint dried. Let dry for a few seconds or a minute and wipe off. This makes it look old or wooden. Finish with sealer. Check out my Jewish Resource page for ordering of catalogs or online shopping with Passover items and craft kits. Many of the online stores sell premade items for Passover too. Eileen's recipes have moved to their own printer friendly pages. The brownies and rolls were my mother's recipes. I don't know where she got them. She used them for years. Everyone loves them and always wants the recipe. If you tell me they are from some book or someone else, I will believe you and give them credit. My mother never used recipes other than for Passover and Purim. Everything else was trial and error. They have a great collection of recipes including Passover ones from famous chefs and many from users of the site. Spike & Jamie Passover Recipes. Check out their video lessons you can watch online or buy for making matzah and wine.